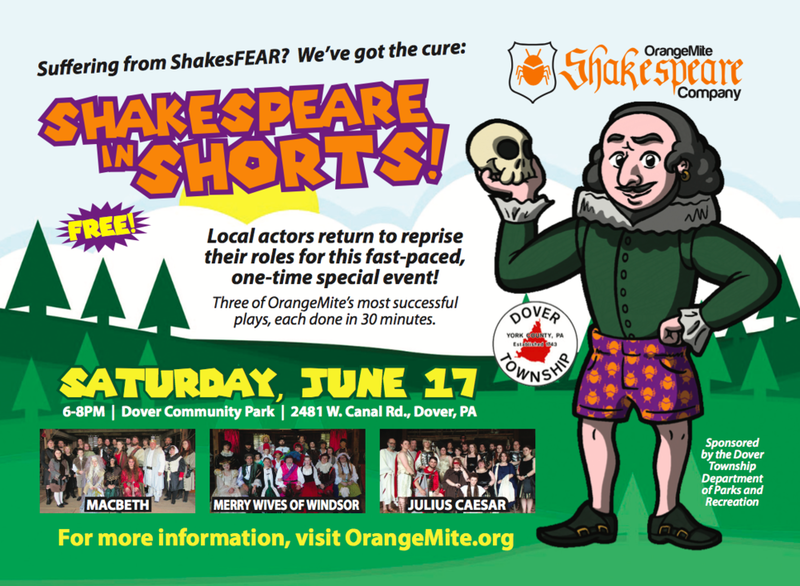 The OrangeMite Shakespeare Company in association with Dover Township presents its first FREE production available to the community! Local actors return to reprise their roles held in three previous productions for this one-time special event. A group of 20 actors will perform 30-minutes versions of Shakespeare’s Julius Caesar, The Merry Wives of Windsor, and Macbeth. This fast-paced, high energy experience is FREE to all members of the community and is a great way to experience Shakespeare in performance for the first time! Be sure to bring a blanket or some chairs, and then just kick back and enjoy the show! The production occurs at the Dover Community Park, 2481 W. Canal Road, Dover, PA 17315.